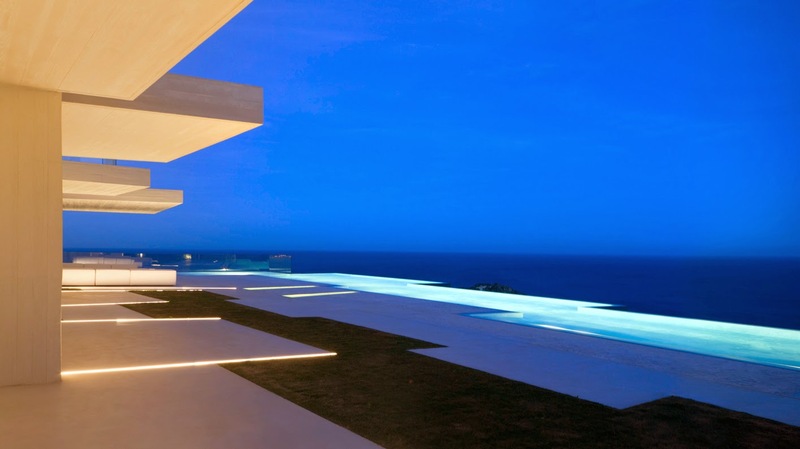 Sardinera House is the latest of the amazing houses designed by Spanish architect Ramón Esteve. 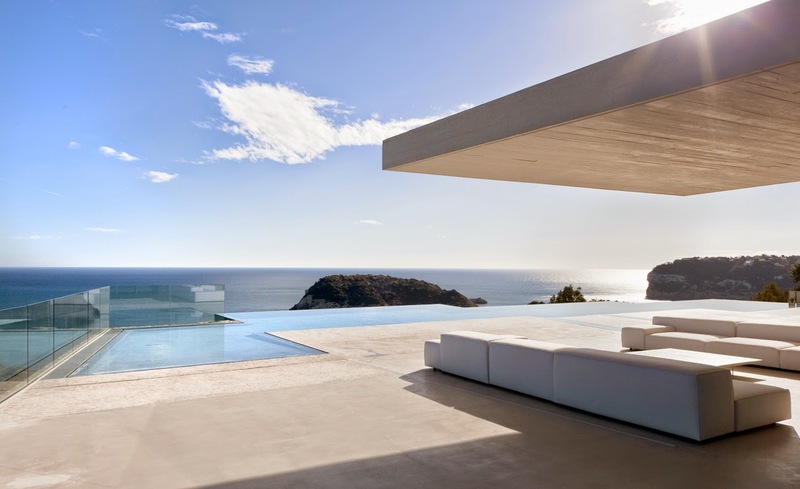 Located in Jávea, Alicante, Spain, the house sits on the top of a hillside, in front of the mediterranean sea. 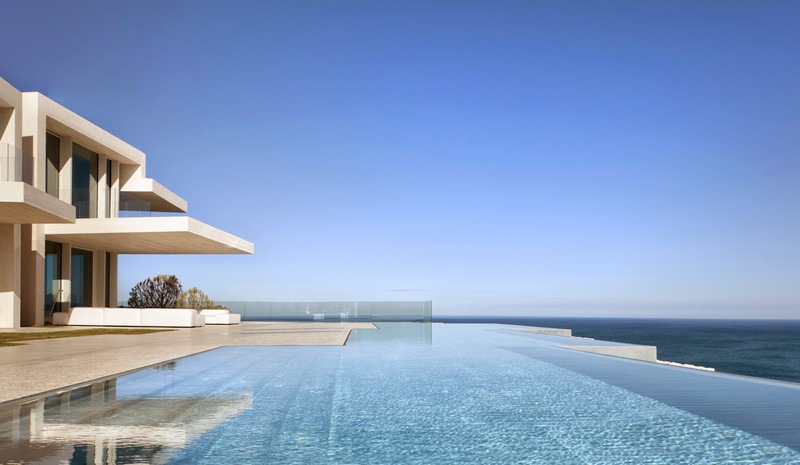 The panoramic views of the setting offer a unique experience, framed between the architectural surfaces of the white concrete walls and the pool surface. 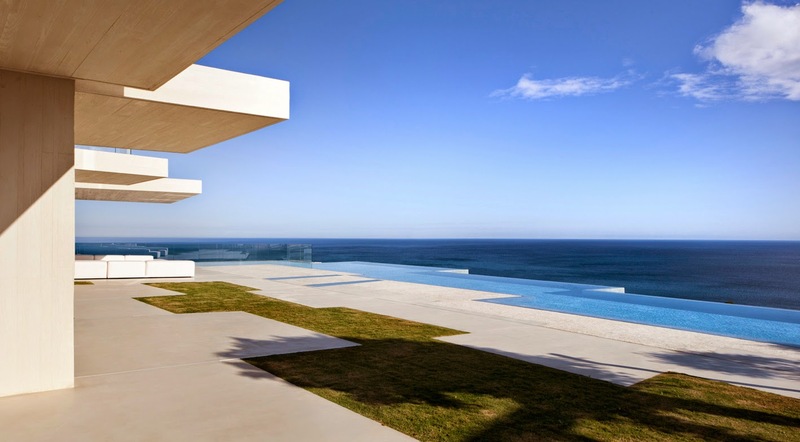 Long cantilevered horizontal surfaces fit in between these vertical walls, extending towards the sea as terraces. 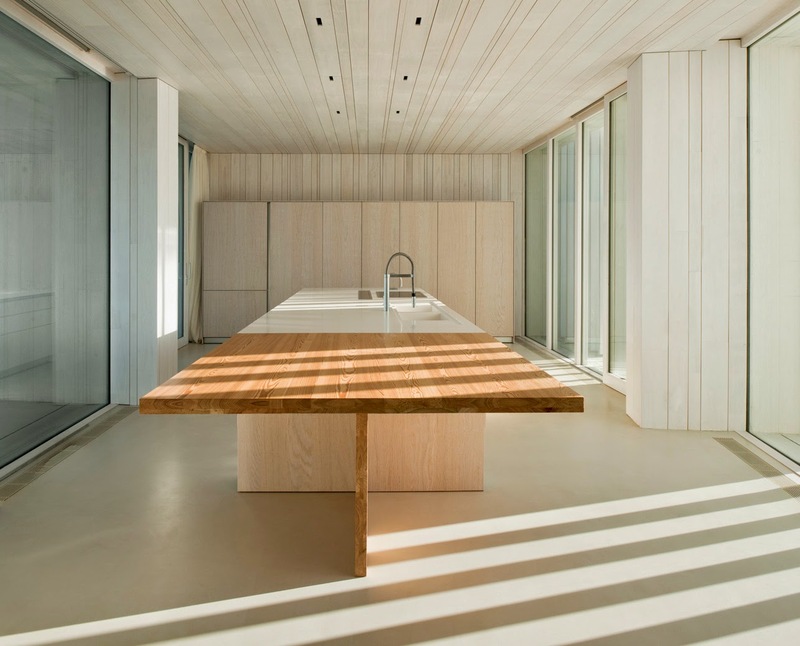 In the interiors, the texture of whitened timber continue that of the exterior white concrete almost seamlessly, establishing a minimalist common language also with other elements of the house, blinds, ceilings, partition walls and furniture. A set of concrete walls exhibited facing different directions, compressing and expanding the views and generating several images. 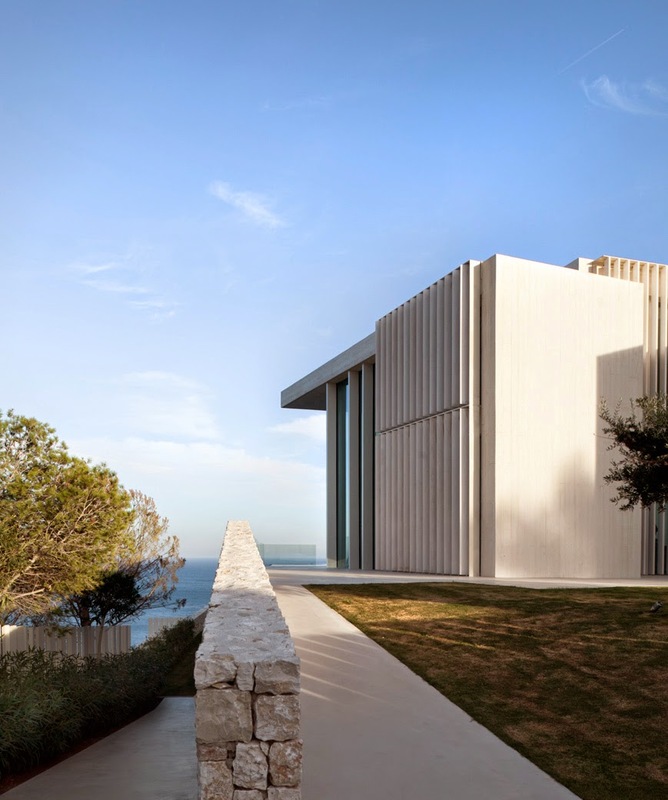 The vertical surfaces are limited horizontally by long cantilevers that extend towards the sea, thus creating verandas that enclose the large terrace. Because of their constructive system, these cantilever don’t lean on the walls, but fit in between them, thus increasing the visual tension and generating paradoxical sensations of massiveness and weightlessness. The longitudinal façades of the house are the opposite. 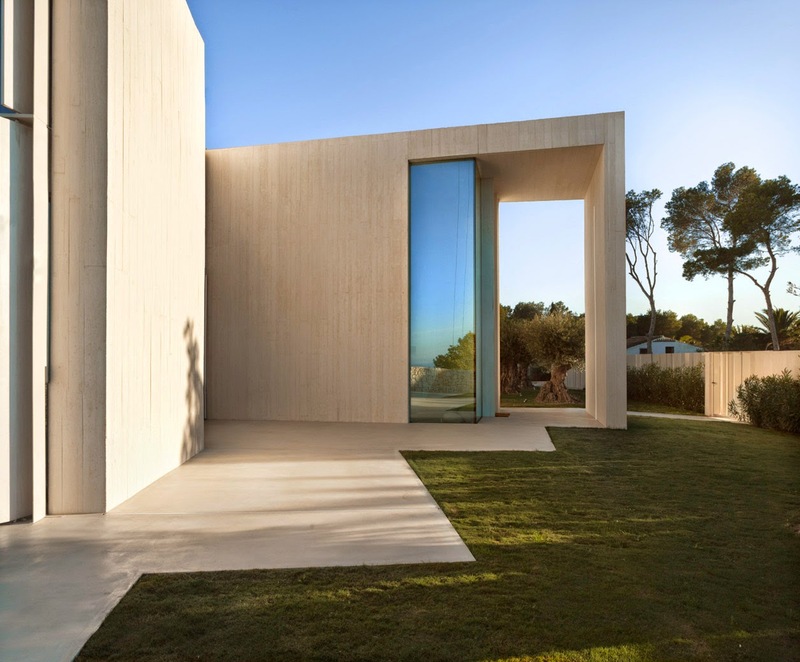 The entrance façade, hermetical and opaque, is protected by an automatic system of adjustable blinds made of whitened Accoya wood. It protects the façade from the sun exposition and, at the same time, limits the viewing from the street. On the contrary, the East façade is much more permeable and transparent. 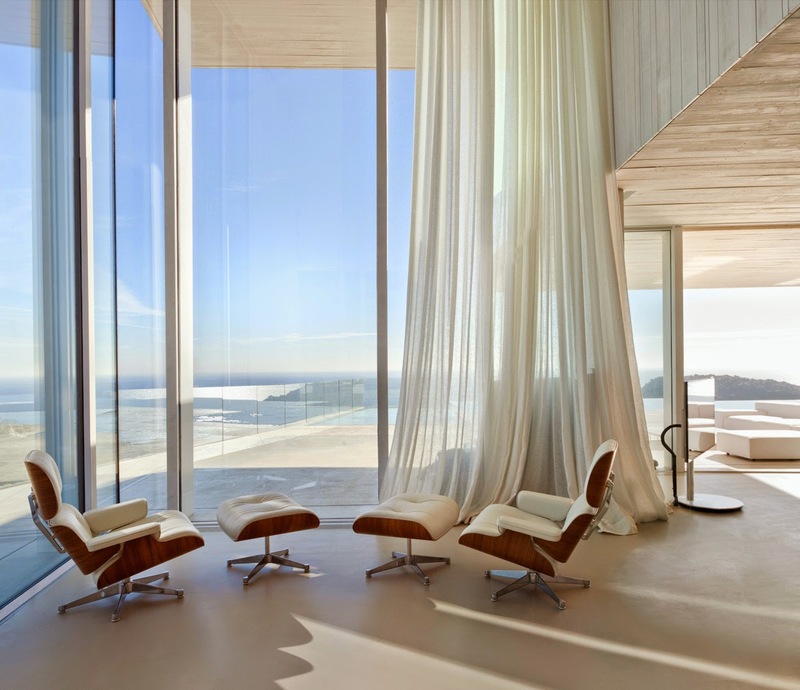 The concrete vertical surfaces are sealed large glass panes, protected by cantilevers and sinuous curtains that bring an ethereal Mediterranean atmosphere. 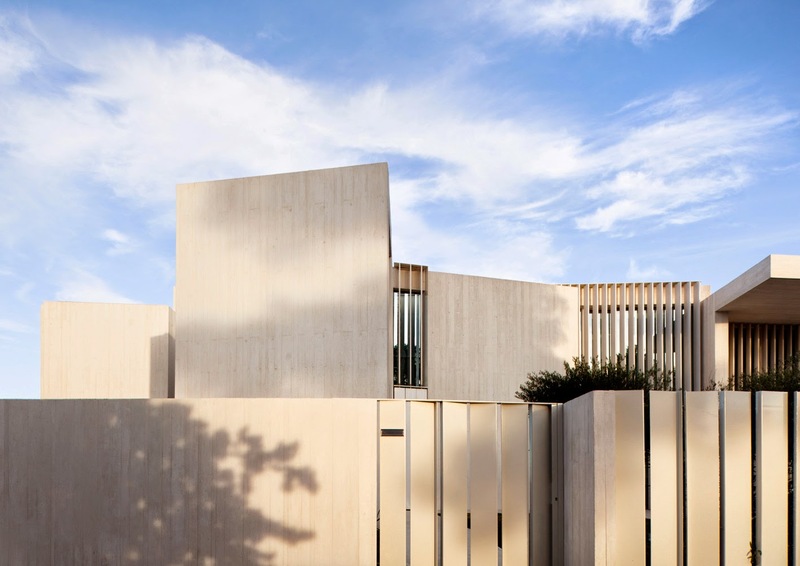 The texture produced by the print of the timber formwork is noticeable on the concrete surface, thus establishing a common language with the white-shaded timber used in blinds, ceilings, party walls and furniture. A white hue covers all the element, which are different just because of its material, generating subtle changes of texture. The local stone masonry walls build a base for the white concrete volumes to stand on and also link the building to the landscape. 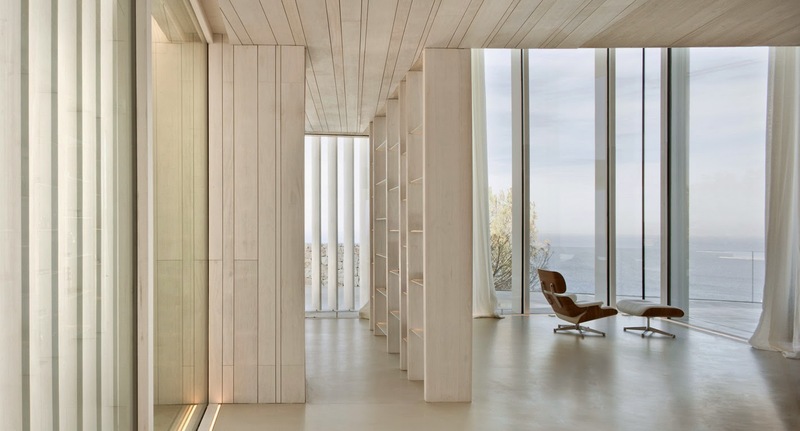 There is an access through a double-height volume with side walls aiming the view at the sea and offering the visitor a first contact with the horizon. The day rooms are on the ground floor, as part of a fluid set articulated by the white concrete walls. Some vegetation is introduced in the in-between spaces, bringing the garden into the house. 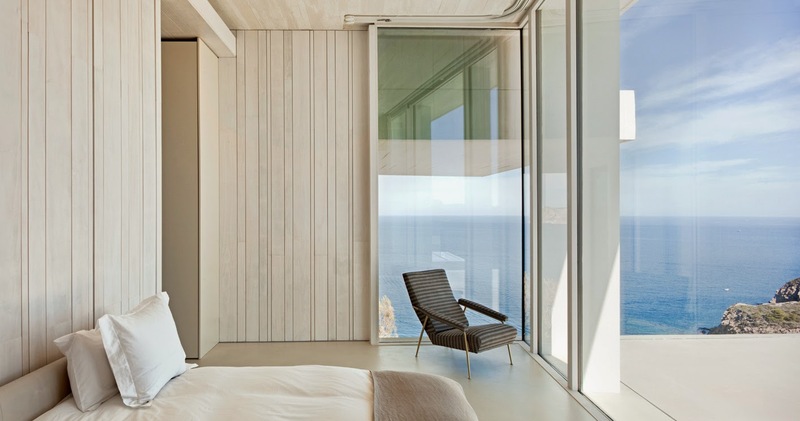 Each room opens towards the horizon through its own veranda. Each volume on the first floor hosts a bedroom. 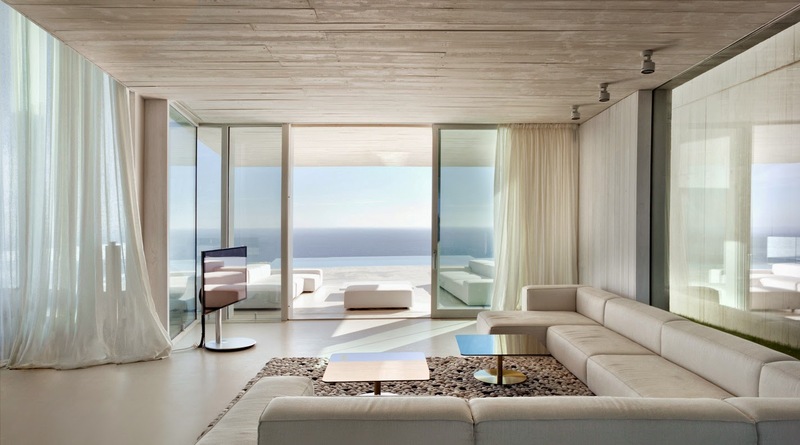 Instead of allowing frontal views framed by the walls, the glass corners offer much more interesting panoramic views. 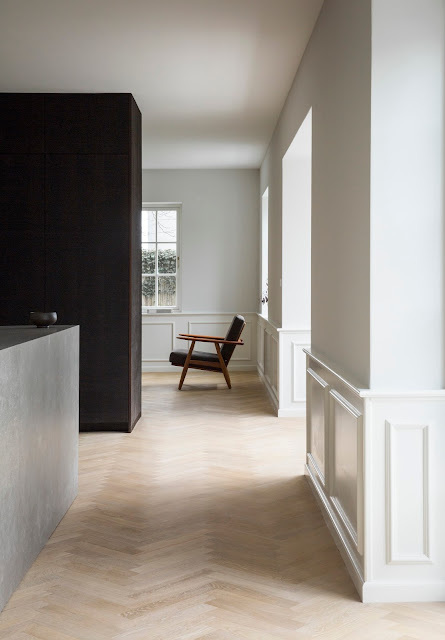 Each room has a small glass balcony, similar to a bay window, set back of the boundary of the cantilever, to enhance the visual importance of the horizontal surfaces. The staircase has been developed as a sculptural element. The sea is visible through its translucent glass steps. 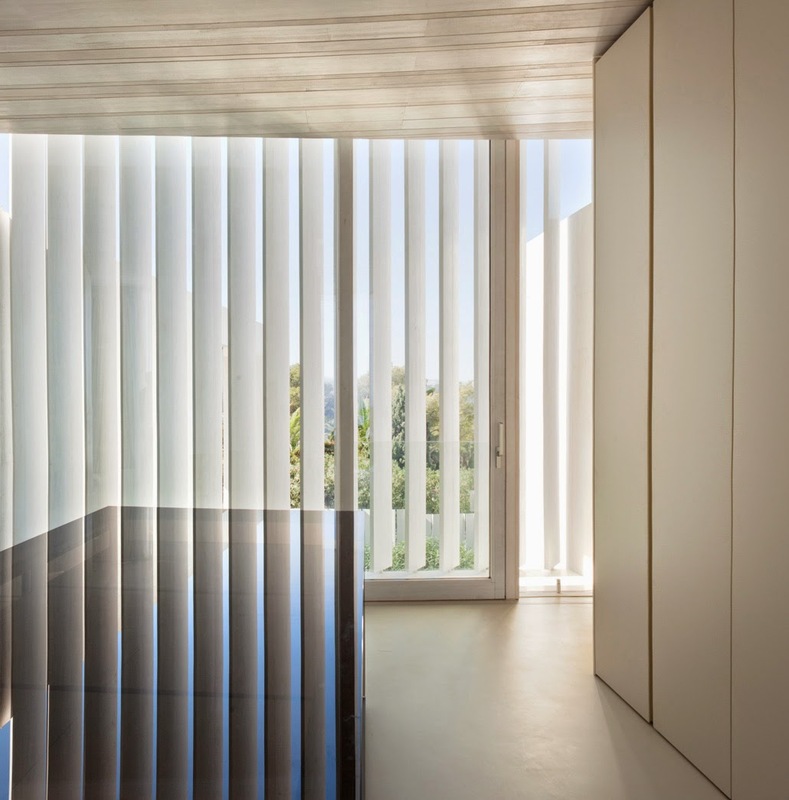 This transparency also allows the natural light to reach the basement. At night, the steps light up as a lamp. 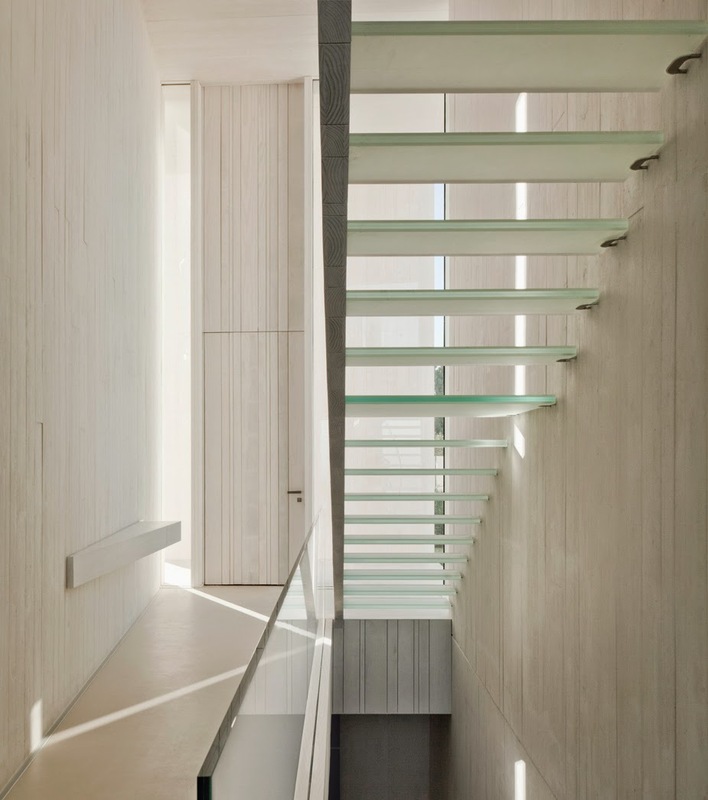 The banister is a sloping surface that follows the same idea than the architectural walls. On the basement floor, besides service and parking areas, there are some guest bedrooms, a gym and an indoor pool, with a sauna and a dressing room. 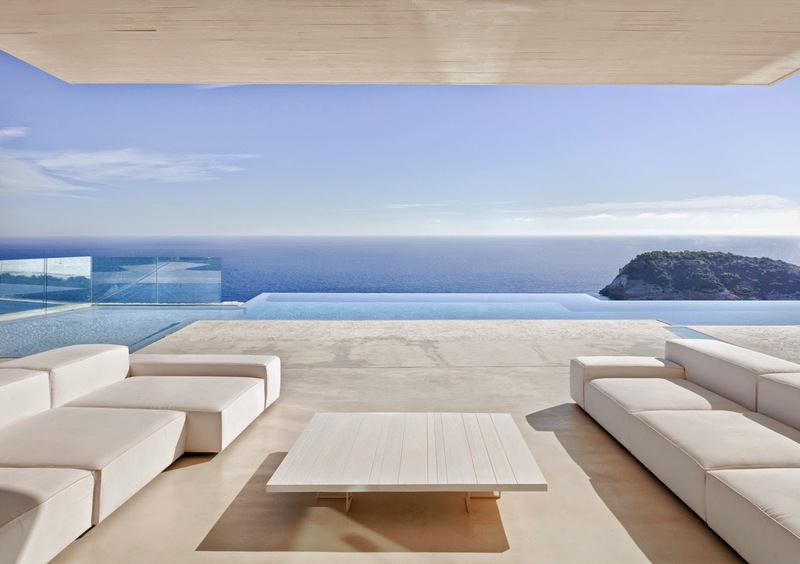 The outdoor space has been designed as an extension of the indoor space. 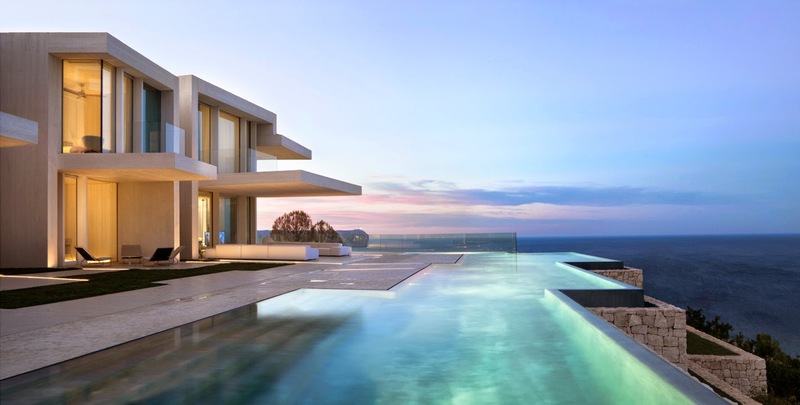 The lines that define the building are drawn beyond the walls, marking the patterns of the vegetation, the pavement, the pool and the outdoor lighting. The garden displays several zones with very different features. Each outdoor zone is singular but belongs to the same concept of a homogeneous indigenous Mediterranean garden. 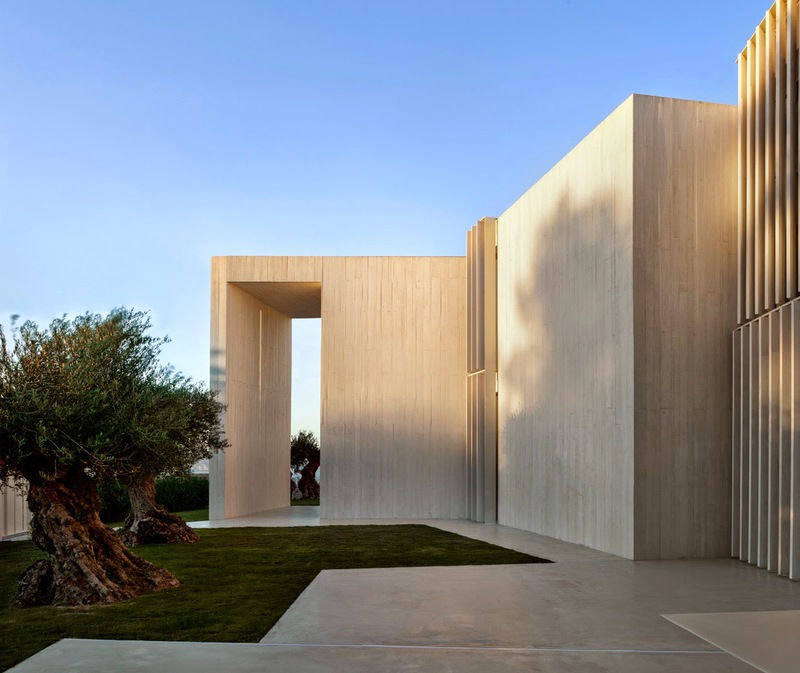 The flat and sunny entrance area, contains some olive trees with big twisted trunks that give personality and elegance to the access. 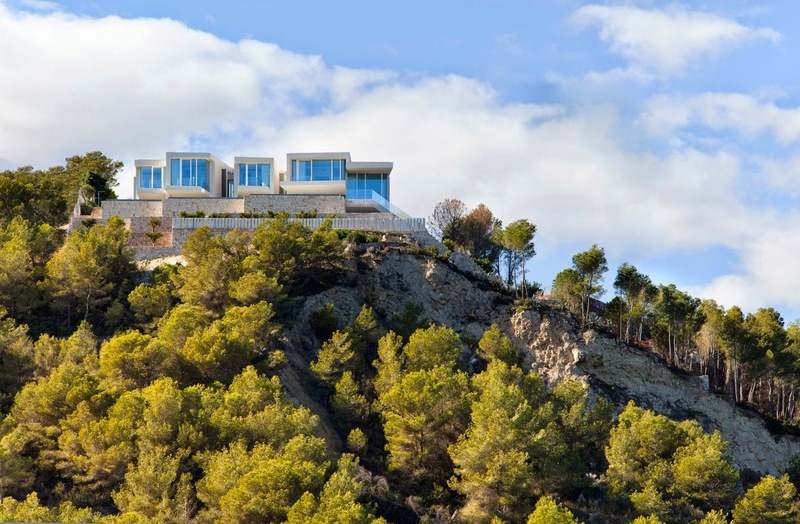 The sloping area recreates the typical terraces of the hillsides by the sea. Pine trees, citrus trees and herbal plants are displayed on these different levels, contained by masonry walls that links the garden to the basement of the house. 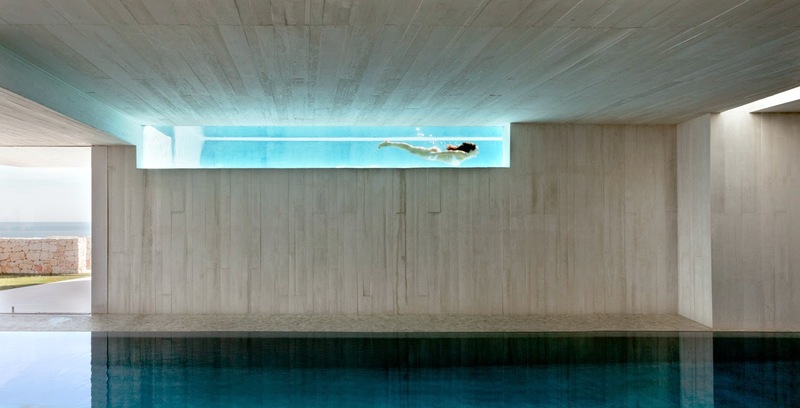 The interior design has been totally made by Ramón Esteve studio. 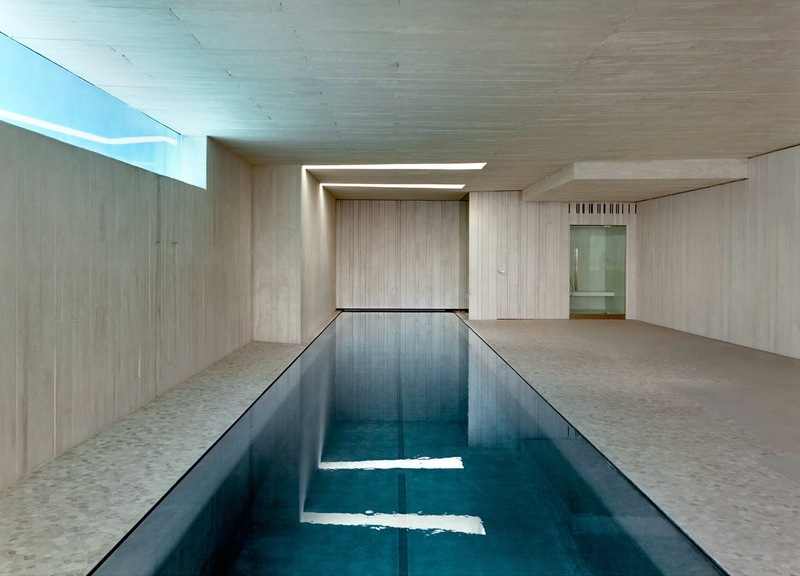 The pavement is made of off-white polished concrete, continuous both inside and outside. All the timber is whitened Accoya wood. 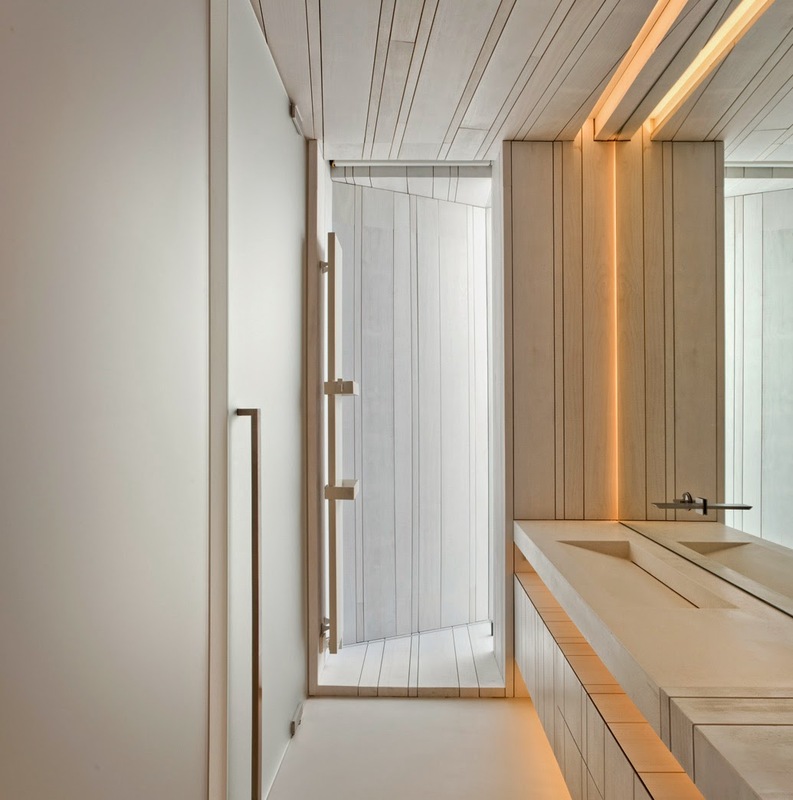 The large hanging benches in the bathrooms are made of natural stone. The pool vases are also made of polished concrete in different tones. There is a lounge area by both swimming pools, defined by its flat cobblestone pavement. All the lights in the house are adjustable LED integrated in the architecture. 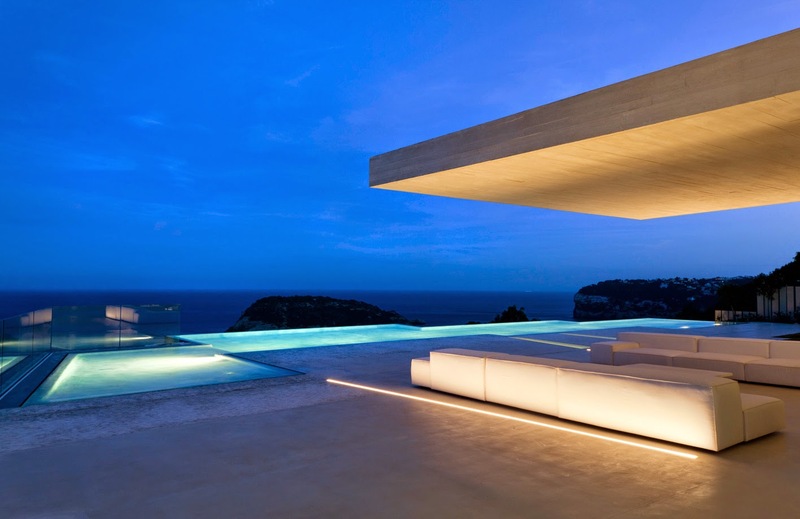 Outdoors, the lines of lighting draw the same direction than the walls of the house."